Please do not treat this piece as “red-baiting.” I am not attacking all “leftists.” When I refer to “The anti-Zionist Left” I am referring to that segment of hard-left activism and academia which is committed to Israel’s destruction as a Jewish national home as a matter of “anti-colonial” principle. What I write below is an attempt to explain the cognitive disconnect between these academics and activists — who literally cannot recognize the antisemitic imagery in their anti-Zionism, and in most cases would probably be horrified and ashamed if they could truly be convinced that it was there, and the damage it does both to us and to them — and the rest of us, who recognize it right away, and struggle to communicate this recognition without sounding like those right-wing apologists who use bad faith accusations of antisemitism to silence any legitimate criticism of Israel’s human rights abuses. 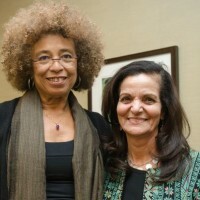 We can detect old roots of the anti-Zionist Left, personified by three contemporary heroes of this movement — Rasmea Odeh, Dr. Angela Davis (pictured together), and Dr. Steven Salaita — back to the noxious anti-Zionism of the Soviet Union. For example, examine this Wikipedia article on Soviet anti-Zionism. The International Women’s Strike was called by Rasmea Odeh and seven others, and Odeh was involved in writing the platform. Odeh, we know, was a member of the Popular Front for the Liberation of Palestine, which was not only funded by the Soviets (like all PLO groups and many other Arab armies and paramilitaries), but had and continues to have an explicitly Marxist-Leninist ideology. The Movement for Black Lives Invest/Divest Section was written partially by the Dream Defenders, a group with Angela Davis on its Advisory Board. During the 1970s, Davis had strong Soviet ideological and institutional connections as a Communist Party activist, and it is not unreasonable to infer that these past connections have shaped her contemporary views on Zionism. Salaita seems to have no direct connection to Soviet Zionology, but his scholarship is rooted in postcolonial theory, which is itself rooted in a basic synthesis of Frantz Fanon (a straightforward Marxist, with Third World peasants replacing the urban proletariat, and the First World replacing the Bourgeoisie), and Edward Said (Orientalism being based on a synthetic theoretical groundwork of Foucault and Gramsci). Being heir to both these theoretical traditions, as well as a general trend on the academic Left which has been in constant conversation with Soviet Zionology via various anti-colonial and postcolonial critics, it’s not surprising that Salaita echoes it as well. Which gets me to my point — that the blatant antisemitism that we see throughout the Arab world (antisemitism of the Protocols type) almost never appears on the anti-Zionist Left; and when it does, they do their best to either hide it when they can, or condemn it when they can’t. Yet the fact that they’d rather hide or deny it than publicly admit antisemitism to be a problem within their own communities says something about where they are — a group/movement that protects its image rather than engaging in extensive self-reflection. Notice this in light of how The Nation editors respond to Rabbi Jill Jacob’s letter at the bottom of this 2015 article by Salaita. She accuses him of hiding under “anti-Zionism” to spread antisemitic tropes, and they reply by assuming that she’s straightforwardly accusing him of antisemitism. They literally cannot understand her actual accusation, because to understand it would require them to deconstruct their own political philosophy. And most people can’t do that, because it would cause too much cognitive dissonance.